All Bedrooms are non-smoking with full en-suite facilities, flat screen digital colour TV, tea making facilities and a hairdryer. Please state when booking whether you would prefer a bath or a shower, all single bedded rooms have a shower. In line with the current legislation, the interior of the hotel is completely non-smoking. Please note, we do have a lift to access all floors, however, some bedrooms are accessed by steps after using the lift. If you have difficulty with steps please state this when making your booking. Bookings are from 14.00hrs on day of arrival until breakfast on day of departure. If you cancel your booking with us you will forfeit your deposit. 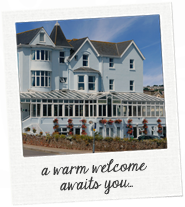 Whatever time of year you choose you are guaranteed a very warm welcome and a holiday to remember. All prices quoted are inclusive of Vat at the current rate. We offer special rates for 30 or more.